The La Quinta Inn & Suites San Antonio Downtown has been awarded the 2016 TripAdvisor Certificate of Excellence award. Samsung Flat-panel TVs with 30 channels of HD programming. Easy-access Plug-and-Play feature makes it simple to connect electronics. 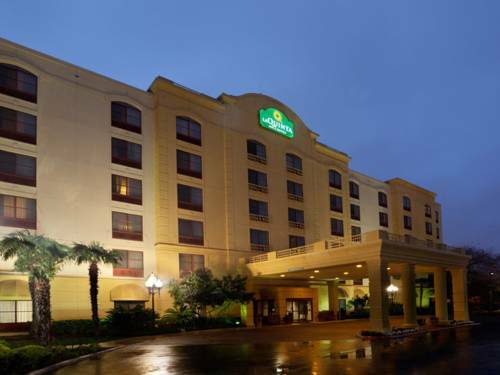 Located downtown among the area's Old Mission Trail, the La Quinta Inn & Suites San Antonio Downtown is within walking distance of all major San Antonio attractions including shopping at Market Square, a variety of great restaurants on the River Walk, The Alamo, Gonzales Convention Center, Alamodome, and the University of Texas San Antonio. Take a refreshing plunge in the outdoor swimming pool and spa at the La Quinta Inn & Suites San Antonio Downtown, and enjoy a hard workout in our well-equipped exercise center. Our spacious suites are loaded with amenities, including high speed Internet access, refrigerator, microwave, coffee maker, and much more. Begin each day with a free Bright Side Breakfast. We have a mini-store in-house; the Clubhouse is open 24 hours. Located off I-35 at Cesar E Chavez Blvd., twenty minutes from San Antonio International Airport, and fifteen minutes from Fort Sam Houston Army Base. Free Bus parking for in house Groups! Located Downtown. We are 5 blocks from the River Walk, 8 blocks from the Alamo, 10 blocks from the Alamo dome, and 4 blocks from Market Square. Reservations not cancelled by 6pm day of arrival local inn time will be charged one night's room and tax. Treasure-filled freak show -- "Five Museums in One" it boasts -- with stuffed animals, horn and antler art, and weird wonders since the 1880s. Enjoy a beer while you admire a cathedral made of 50,000 matchsticks; an 8-legged, 3-eared lamb; and a replica Bonnie and Clyde Death Car. < 1 mile from San Antonio. ~26 miles from San Antonio. Rural Texas town celebrates its watermelon industry with an annual festival and a year-'round majestic 'melon water tower. ~55 miles from San Antonio. ~64 miles from San Antonio.